A diaphragm valve is different in structure from the general valves. It is a new type of valve and a special type of shut-off valve widely used in various fields. Its opening and closing member is a diaphragm made of soft material. The inner cavity of the cover and the driving member are separated. Commonly used diaphragm valves are rubber-lined diaphragm valves, fluorine-lined diaphragm valves, unlined diaphragm valves, and plastic diaphragm valves. The diaphragm valve is provided with a flexible diaphragm or a combined diaphragm in the valve body and the valve cover, and the closing member is a compression device connected to the diaphragm. The valve seat can be either a dome or a tube wall that is straight through the runner. The advantage of the diaphragm valve is that its operating mechanism is separated from the medium passage, which not only ensures the purity of the working medium, but also prevents the possibility of the medium in the pipeline impacting the working parts of the operating mechanism. In addition, no separate seal of any form is required at the stem unless it is used as a safety feature in controlling hazardous media. In the diaphragm valve, since the working medium is only in contact with the diaphragm and the valve body, both of which can be used in a variety of different materials, the valve can ideally control a variety of working media, especially for chemically corrosive medium or medium with suspended particles. The operating temperature of the diaphragm valve is typically limited by the materials used in the diaphragm and body lining. It operates over a temperature range of approximately -50 to 175 ºC. The diaphragm valve has a simple structure and consists of only three main components: the valve body, the diaphragm and the valve head assembly. The valve is easy to disassemble and repair quickly, and replacing diaphragm can be completed on the spot and in a short time. Diaphragm valves are mainly classified into four categories according to the flow pattern: weir diaphragm valves, through diaphragm valves, angle diaphragm valves and direct current diaphragm valves. Examples of weir type diaphragm valves are stainless steel lined diaphragm valves, normally closed pneumatic diaphragm valves and sanitary class diaphragm valves. Examples of through diaphragm valves are flanged through diaphragm valves. Angular diaphragm valve products for example: angular diaphragm valve. Examples of DC diaphragm valve products: DC diaphragm valve. Weir-type diaphragm valve: also known as roof-type diaphragm valve, the valve body has a ridge-shaped bulge, diaphragm and valve disc contact, valve stem up and down movement and through the valve disc drive diaphragm and roof contact to achieve the purpose of channel separation. When the diaphragm is not in contact with the tail ridge, it has a certain throttling effect. Short travel requires lower diaphragm deflection, no dead angle of silting medium, simple and reliable structure, and good wear resistance. The insufficiency is that there is a ridge-shaped bulge in the runner, resulting in greater flow resistance of the medium. Weir diaphragm valve is also one of the most widely used diaphragm valves. Straight-through diaphragm valve: The valve body is like a straight tube. When the valve is fully open, the medium is DC-free. Therefore, the fluid resistance is small, the cutting and flowing ability is good, and the corrosion-resistant shear can contain granular media. The disadvantage is that when closing the valve, the diaphragm travel factory requires higher diaphragm flexibility. Angular diaphragm valve: The inlet and outlet are 90 degrees, and the corner of the valve body is equivalent to weir structure. It has the function of changing the flow direction of medium at 90 degrees. The disadvantage is that the pressure loss is large and the installation space is large. DC Diaphragm Valve: It has the characteristics of DC Globe Valve and Diaphragm Valve. Seats and discs are sealed. The upper end of the disc has a diaphragm as a middle flange seal and packing seal. It also acts as a separator between the body and the cover. The cover part does not touch the medium. It has high bearing capacity and sealing performance, linear fluid flow, good flow capacity and low flow resistance. However, the structure is complex and costly, and the special direction of the handwheel should be taken into account in the installation of the official road. There are several types of diaphragm valves, but the common parts are more or less the same. The parts that compose the valves are significant as they define how the diaphragm valve would function and ultimately how the whole system would work. Valves are used in many various housing systems and typical items. Understanding the parts of diaphragm valve is significant and would require understanding of what they are composed of. The frame of the diaphragm valve is the outer frame. This incase the internal parts of the edge and these are composed of various materials such as plastic casings and stainless steel. Copper, bronze, stainless and alloy steels are often used to regulate materials that are more durable to handle than water. Some other valves require being able to withstand corrosion as liquids, gases and frozen solids could be transformed to pass these materials. The cap is attached into the body, and it serves as the frame cover. This is made to compose the insides of the valve in steady place. If you want to repair on the insides of the valve, you need to rig the cap off. Some valves such as ball valves don’t have these caps, as they are also bolted together inversely. The Lever of handle is one of the most noticeable parts of the diaphragm valve. Diaphragm valves could have wheel-like handles or lever-like handles depending on the specifications of the manufacturer. There are some kinds of valves such as check with no handles since these valves control the motion of liquid inside. There are also levers of diaphragm valves that are automatically controlled. The ball is a distinct part of diaphragm valves. As compared to a butterfly valve wherein there is a disc that moves in line with the valve, or in a check valve where it rotates on a hinge, the ball disc controls the fluid passing the valve with the help of seat rings. The stem part of the diaphragm valve passes through the bonnet. 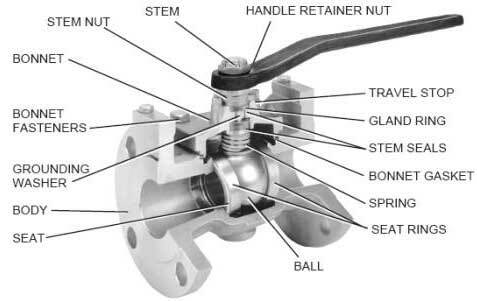 The stem of this valve is the part that conducts the flow of the lever to the ball of the valve. This could be attached to move the ball in two directions inside the frame of the diaphragm valve. There are numerous reviews on diaphragm valve parts over the web. This is always good to select the one that would work best to your housing system. Learning on the parts of the diaphragm valves could make your plumbing system work better and more efficient. The structure is simple, easy to disassemble and repair, and the diaphragm can be replaced on site. Because the control mechanism is separated from the medium, only the valve body and the diaphragm are in contact with the medium. Valve body and diaphragm are made of different materials, which can adapt to many special media, especially highly hazardous media and highly corrosive media. They can be applied to cleaning media in food, medicine and health industries (such as health-grade diaphragm valves). Or medium with corrosive and suspended particles. The medium will not leak through the valve stem. However, due to the special structure of the diaphragm and the limitation of the diaphragm, the diaphragm valve can not adapt to the high temperature and high pressure field. The working temperature and pressure caliber of the diaphragm valve are limited by the diaphragm and valve body or lining material as well as the manufacture. The operating conditions are that the temperature is less than 180 degrees Celsius, the nominal pressure is less than 40 kilograms and the nominal diameter is less than 200 mm. The diaphragm valve relies on the diaphragm deflection to open and close the valve. The diaphragm is easily damaged by repeated deflection, resulting in leakage. Diaphragm valves use corrosion-resistant liner body and corrosion-resistant diaphragm instead of valve core assembly, and use the movement of diaphragm to regulate. The valve body material of diaphragm valve is cast iron, cast steel or cast stainless steel, and is lined with various corrosion or wear resistant materials, diaphragm material rubber and PTFE. The lining diaphragm has strong corrosion resistance and is suitable for the adjustment of strong corrosive medium such as strong acid and alkali. The diaphragm valve has the advantages of simple structure, small fluid resistance, larger flow capacity than other valves of the same specification, no leakage, and can be used for adjusting high viscosity and suspended particle medium. The diaphragm isolates the medium from the upper chamber of the stem, so there is no filling medium and no leakage. However, due to the limitation of diaphragm and lining materials, the pressure and temperature resistance are poor, generally only suitable for nominal pressure of 1.6 MPa and below 150 C.
The flow characteristics of the diaphragm valve are close to the fast-opening characteristics, which are approximately linear before 60% of the stroke, and the flow changes little after 60%. Pneumatic diaphragm valves can also be equipped with feedback signals, limiters and positioners to meet the needs of automatic control, programmable control or flow regulation. The feedback signal of pneumatic diaphragm valve adopts non-contact sensing technology. The product uses thin film propulsion cylinder instead of piston cylinder, eliminating the disadvantage of easy damage of piston ring, causing leakage and unable to push the valve open and close. When the gas source fails, the hand wheel can be operated to open and close the valve. Diaphragm valves have only three main components: body, diaphragm and bonnet assembly. The diaphragm separates the inner chamber of the lower valve body from the inner chamber of the upper valve cover, so that the parts such as stem, stem nut, disc, pneumatic control mechanism and electric control mechanism located above the diaphragm do not contact with the medium, and do not produce medium leakage, thus eliminating the sealing structure of the packing letter. Diaphragm valve is a special type of cut-off valve. Its opening and closing parts are a diaphragm made of soft material, which separates the inner chamber of the valve body from the inner chamber of the valve cover. Due to the limitation of body lining technology and diaphragm manufacturing technology, it is difficult to manufacture larger body lining and diaphragm. Therefore, diaphragm valves are not suitable for larger diameter pipelines. They are generally used in pipelines less than DN200. Due to the limitation of diaphragm materials, diaphragm valves are suitable for low pressure and low temperature situations. Generally, it should not exceed 180 C. Because the diaphragm valve has good anti-corrosion performance, it is generally used in corrosive media devices and pipelines. Because the temperature of diaphragm valve is limited by the material of diaphragm valve body lining and diaphragm. (2) It can be used for medium containing hard suspended matter; because the medium only contacts with valve body and diaphragm, there is no need for packing box, there is no leakage problem of packing box, and there is no possibility of corrosion to the stem part. (3) Suitable for corrosive, viscous and slurry media. (4) Can not be used in high pressure situations. Prevention and elimination methods: regular replacement. Preventive and exclusive methods: the operation force should be small, pay attention to the closure of markers. Prevention and removal methods: do not force closure during operation, should repeatedly open and close several times, flush away foreign bodies, formally close the valve; after damage to the diaphragm, timely replacement. Prevention and elimination methods: It is not appropriate to open too high during operation. Prevention and removal methods: Do not be too high when opening, repair or replace the diaphragm in time when falling off. (2) Causes: the connecting pin of the stem and disc drops off or is broken by wear and tear. Prevention and elimination methods: When opening, it is not allowed to exceed the upper dead point. When leaving, it should be repaired in time. Prevention and elimination methods: regular cleaning, coating of graphite and molybdenum disulfide powder for lubrication on the active part; fluorine diaphragm structure can add a small amount of grease to the active part. Before installing the diaphragm valve, carefully check whether the operating conditions of the pipeline are in conformity with the scope of application specified by the valve, and clean the inner chamber to prevent dirt from blocking or damaging the sealing parts. Rubber lining and rubber diaphragm should not be coated with grease to prevent rubber swelling and affect the service life of diaphragm valve. Handwheels or transmission mechanisms are not allowed to be lifted and collisions are strictly prohibited. When operating diaphragm valve manually, auxiliary lever should not be used to prevent excessive torsion from damaging driving parts or sealing parts. Diaphragm valves should be stored in dry and ventilated rooms, and stacking is strictly prohibited. Both ends of the diaphragm valves must be sealed, and the opening and closing parts should be in a micro-opening state. A diaphragm valve is different in structure from the general valves. It is a new type of valve and a special type of shut-off valve widely used in various fields. Its opening and closing member is a diaphragm made of soft material.